To get from Burkina Faso to Italy, best friends Ayiva and Abas cross a desert and a sea, living through squalid conditions, robbery, violence, and near-drowning. For the first 15 minutes of Jonas Carpignano’s Mediterranea, the two men persevere through one setback after another, before they finally reach their destination, in what some movies would call a happy ending. But Carpignano keeps going, following the pair as they settle into a shantytown alongside prostitutes and day-laborers, all living in constant fear of arrest and deportation. Ayiva and Abas are trying to lay the foundations of a better life for their families back in Africa, but nothing in Europe is quite like they’d been promised. They endure anyway, because they’ve invested too much time, money, and sweat to quit. Mediterranea belongs to two subsets of world cinema that often overlap: neorealism, and stories of immigrants’ struggles in a new country. It bears some similarities to Ousmane Sembène’s 1966 classic Black Girl, and to the early films of Luchino Visconti, in that it’s unusually attuned to how pervasive racism and classism rattles an already unstable job market. But it’s also akin to the more recent Chop Shop and Mother Of George, in that Carpignano considers how technology is changing so much for people living far from home—even the nature of their alienation. The significant new wrinkle for Mediterranea is that Carpignano also covers the rising tide of anti-immigrant sentiment sweeping across Europe. Not long after Ayiva and Abas arrive in Italy, they’re nearly run over—twice—by local hoodlums trying to intimidate them. Then they find an off-the-books job in an orange grove, where their supervisor keeps asking for more work at less pay. Later they join with their fellow squatters to try and fend off an organized purge of their little ramshackle community. Koudous Seihon plays Ayiva, the more serious-minded of the two, who’s willing to undervalue his labor and kowtow to his Italian bosses in order to maintain a steady income to share with his wife and daughter back home. Alassane Sy is Abas, who’s more gung-ho about grabbing some of the prosperity and pleasures of Italy, and more outraged when he finds he’s not really welcome there. Although Carpignano mostly sticks close to Ayiva, it was a smart choice to have a second protagonist, because it gives the movie multiple perspectives, and gives the heroes someone to talk to. 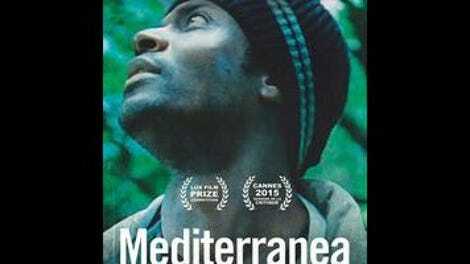 Often these kinds of stories emphasize the isolation and miserablism of being a foreigner, but Mediterranea has moments of camaraderie and lightness that make the contrasting despair all the more palpable. There’s an episodic quality to Mediterranea that sometimes works against it. Carpignano doesn’t always bother to set up what’s going on, or to take the time to establish how one scene is meant to flow into the next. The film is more an immersive experience—going for a “you are there” vibe as the camera pulls in tight on Ayiva stealing a suitcase to get some clothes, or him picking oranges in the pouring rain. Carpignano seems to be making a special effort to avoid any open sentiment. The film is making clear points about the callous treatment of migrant workers, but this isn’t a tract, it’s a character sketch, and as such it can seem a little freeform. Nevertheless, there’s a specificity to Mediterranea that at times makes it feel like an actual documentary. Carpignano dwells on the day-to-day of these men’s lives in Italy, as they save up money to buy the cellphones and netbooks they need to stay in touch with their loved ones, and as they come to understand that even the friendliest locals will only ever see them as “the help.” And while the filmmaker shies away from pushing buttons too hard, he does work his way to a few epiphanic moments, as in a heartbreaking sequence where Ayiva watches his daughter dance via Skype and then watches his employers’ family do the same at a party. At that moment he’s come so far, yet feels like he’s landed in limbo—doomed to peer at his old home at a distance, from a country where he’s almost invisible.